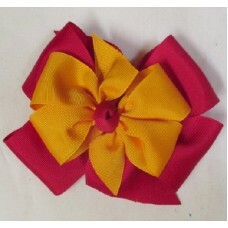 This custom cheerleading hair bow has a 2 1/4" large 4 loop bottom with a 1 1/2 ” top. Please note that the ribbon graphic color will not change with selection. The options selected will show clearly in your cart.